When you clean with Bar Keepers Friend, your effort is multiplied, thanks to our unique two-stage formulation. Other cleansers resort to bleach for tough jobs, but Bar Keepers Friend starts with a plant-based solution. As you clean, oxalic acid—found naturally in plants like rhubarb—works at a molecular level, breaking the bonds that hold rust and lime stains together. Then micro-scrubbing particles remove deposits and gently polish the surface. You get a great clean without worrying about harsh ingredients. Our two-stage formulation means you don’t need as much elbow grease to get the job done. Cleaning with Bar Keepers Friend is simple — the cleaner is doing twice the work. No matter what needs to be done, Bar Keepers Friend has a solution. I am preparing my 1942 house for sale. I just used Bar Keepers Friend on the original kitchen sink, and I can't believe how clean it got! Thanks for a great product! I just wanted to say great job! I have started using Bar Keepers Friend Cleanser and Polisher on most of the items in my kitchen. It cleans and does not scratch my stainless or porcelain. Thanks again. My husband wanted me to write Bar Keepers Friend and let y'all know how much he loves y'alls products! We have stainless steel pots and pans, he uses Bar Keepers Friend to clean those, our sink, and even makes a paste to clean our glass top stove. It is truly a universal cleaner. Our classic oxalic acid-based cleaning powder is the most flexible choice. Pre-mixed for consistency, Soft Cleanser is great for vertical surfaces like shower doors. This gentler formulation can be used as a spray or foam, with a flexible bottle that works at any angle. With 50% more grease and stain removal power than classic Cleanser & Polish, this cleaner tackles the toughest jobs in the kitchen and beyond. Specially formulated to removed burned-on food stains, this cleaner is gentle enough to use on glossy induction cooktops at a fraction of the price of the other brands. 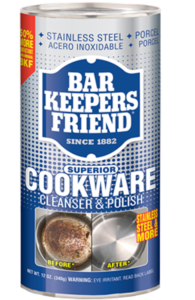 Not convinced that Bar Keepers Friend can tackle your tough cleaning project? View users' before and after photos and see why we say, Once Tried, Always Used.